ItemC-00194 - Sandon after the flood of 1955; boulders and debris in the street; Reco Hotel on the left, city hall behind it; Sandon Hotel on the right. ItemI-84346 - Main entrance of Work Point; Head Street, Esquimalt. ItemC-00200 - Sandon after the flood of 1955. ItemC-00202 - Washout at the Silversmith mine, near Sandon. 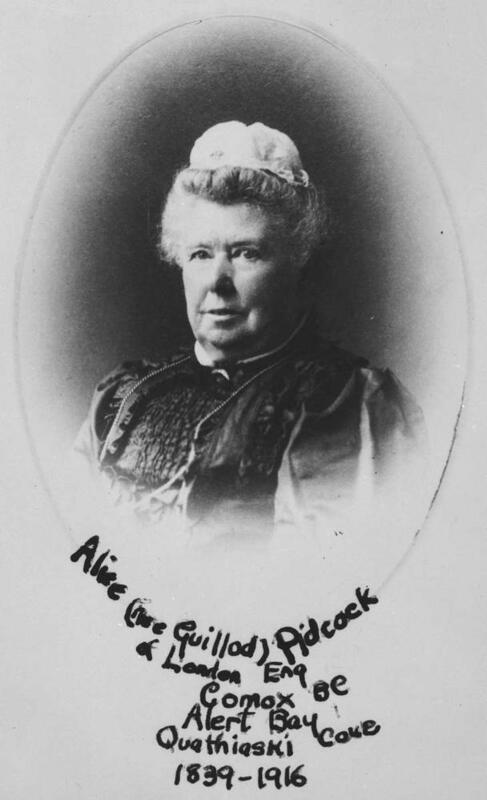 ItemC-00204 - "Alice, nee Guillod, Pidcock of London, England, Comox BC, Alert Bay, Quathiaski Cove; 1839 - 1916." ItemC-00230 - Governor Douglas visits Colonel Moody, R.E., during the construction of the Cariboo Road in British Columbia, 1862. ItemI-84250 - The members of the Victoria I.O.D.E. ItemC-00241 - The headstone of Richard Clement Moody, Bournemouth. ItemC-00243 - The Royal Bath Hotel at Bournemouth, Hants, where Richard Clement Moody retired died in 1887. Item C-00204 - "Alice, nee Guillod, Pidcock of London, England, Comox BC, Alert Bay, Quathiaski Cove; 1839 - 1916."